What is a Mars simulation ? A Martian simulation consists of bringing together experts for a few days or weeks in terrestrial locations very similar to Mars, to perform one or more missions (scientific experiments with associated procedures and protocols, studies of human behavior in autarky …) . Deserts and glaciers are perfect places for Mars simulations because they are extreme environments, representative of what is the surface of Mars. The AMADEE-18 program organized by the Austrian Space Forum (OeWF), for example, was held in the Oman Desert in February 2018. The Oman Desert was chosen for its strong resemblance to Mars (reddish rocks, dunes …). Who can participate in a martian simulation ? Anyone can be a candidate for a Mars simulation! However, it is necessary to distinguish playful Martian simulations for tourists or friends groups (short stays, without special preparations), from simulations that have scientific aims such as the AMADEE-18 simulation. Scientific simulations require a long process of preparation : procedures development, manufacture of hardware and associated softwares, assembly of experiments and training of analog astronauts. 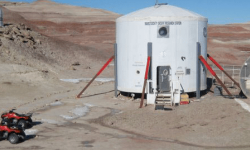 How is organized a Mars simulation ? Participants in a martian simulation are divided into two teams : the analog astronauts located on the martian base (“on Mars”) and the control center (“the Earth”) located in another location. During the AMADEE-18 mission, the control center was located in Innsbruck, Austria. The control center members are in contact with the “principal investigators”, who are laboratories and other research organizations that commissioned studies / experiments on Mars. If the results of the scientific experiments carried out by the analog astronauts on Mars are not consistent with the expected results, the principal investigator can ask to stop the experiment on Mars to redefine the model of the experiment. The control center is thus the liaison between the sponsors of the experiments and the martian base, it directs and adjusts the actions to be performed on Mars. For more realism, a communication delay of 10 minutes has been set between the control center in Austria and the martian base in the Oman desert. On the martian base, the team has different responsibilities and missions. A person located in the operations center of the martian base is in charge of collecting by telemetry the data collected by the analog astronauts during their field trips. Not the same people always carry out the same experiments : some people are experts on one or two experiments, but all analog astronauts perform all types of experiments. Thus, everyone can do everything and it is not essential that the same person works on an experience in the morning and evening. Analogous astronauts have a 3-day planning of what needs to be done in order to be able to prepare the experiments, and to cope with the unforeseen events that have an impact on the the next day’s experiences. The planning remains 80% unchanged. The missions last from 8 a.m. to 8 p.m., with a 20 minutes break on average. Apart of this mission time, analog astronauts continue to work on less important tasks (repairing a torn glove, maintenance operations …). Each analog astronaut is responsible for one or more subjects. For example, one person is in charge of the space suits, another is responsible for the management of resources… In addition, doctors and security officers are also present. They have no other roles during the mission and have been trained to manage an group for several weeks. Security officers accompany the analog astronauts during field trips (for example, in case the batteries located in the suits catch on fire). An analog astronaut can one day do the maintenance of the combination (maintenance of the connectors, repair of torn gloves), one day operate a drone or a rover, one day to carry out experiments outside… The analog astronauts days are not routinely ! What does a martian base look like ? A huge inflatable dome 15 meters in diameter rose between the containers. It hosted medical equipment, sports equipment, a DIY / welding workshop, 3D printers, and a rover. What are the scientific goals of a Mars simulation ? Analog astronauts must perform different types of scientific experiments in the field. The 15 analog astronauts of the AMADEE-18 martian simulation have, for example, carried out 20 experiments. Here are some examples below. HUSKY realizes autonomous 3D maps in the field. When the analog astronauts arrive on the field, the rover has already mapped and can therefore signal the dangers to avoid (holes for example). The terrain is secure and the analog astronauts are not afraid to fall with their 45 pounds space suits ! The Mars simulation has identified points of improvement of the rover, for example the protection of the push buttons against the sand, the improvement of the software so that the martian rover is less likely to get stuck in the sand, etc. The drone mission is to map the martian surface using GPS sensors, inertial units and cameras. An algorithmic structure allows the drone to navigate autonomously. The analog astronaut makes a visual description of the rocks to the operator and takes pictures that are sent by telemetry to the operations center of the martian base. The collected samples are placed in a bag and stored in a case on the chest of the analog astronaut. The tool that picks up the rocks was printed in 3D on site. The 3D printing process can also repair objects throughout the Mars simulation. Transceivers are hung on the analog astronauts and antennas are placed in the field to recreate an active tracking system equivalent to GPS. Hydroponics is a cultivation technique that uses layers of sediment and UV lamps brought to the site, without soil (the Mars soil is not fertile, nothing can grow as it is). During this experiment, many measurements were made. The night temperature variation was stronger than expected (10° Celsius instead of 16° Celsius), which slowed seed germination (20 days instead of 15 days). At the end of the experiment, analog astronauts were able to eat these crops. The greenhouse also played a role in the minds of the mission participants, as in the International Space Station (ISS). Seeing something that is growing, living, is positive from a psychological point of view. Every morning, everyone came to see how the plants were. Analog astronauts do not get bored ! In addition to scientific missions, participants carry out maintenance operations in the morning and evening. For example, antennas must be installed and removed every day and restarted after high winds. All this maintenance was done very early in the morning and in the evening, apart of the simulation periods. What does a typical day look like on the martian base? During the AMADEE-18 simulation, the martian team’s mornings were devoted to maintenance. Space suits were prepared between noon and 2 pm, and field operations started at 3:30 pm or 4 pm, when temperatures began to be more bearable. At the beginning of the Mars simulation, the analog astronauts prepared the space suits in the morning and went out at noon, but it was too hot in the space suits and they had to come back in a hasty way. Since 2009, Austrian Space Forum (OeWF) volunteers have been organizing every two years a martian simulation of several weeks named AMADEE (in reference to Amadeus Mozart, the most famous Austrian composer). The objective for the Austrian Space Forum is to test its AOUDA space suit in order to qualify it for space exploration missions. A box located at the chest accommodates a control panel, tools, USB ports. The gloves are composed of 3 superimposed layers, with an outer membrane covered with an aluminum coating. An exoskeleton applies pressure to support the movements, which is very useful to hold the movement when the analog astronaut leans, because this jewel of technology weighs 45 kilos ! “I participated in the AMADEE-18 martian simulation in the field with the team of analog astronauts. The day planning is influenced by the environment (heat, maintenance), that is a reality. To be effective, you have to have repeated and planned a lot of things before the mission. We are very much trained on reactivity to fire. We fear much less if we are well prepared, spending a lot of time preparing the mission is not wasted time ! Pictures courtesy of Aline Decadi. Aline answers all your questions about the Mars simulation! Realistic ! When I look at the videos filmed by the Curiosity rover on Mars, I see that the planet Mars is covered with vast expanses of dust and sand, and the surface is littered with rocks and blocks. This is exactly what we saw in the Oman desert. Sometimes, the dust is lifted by the wind and turns into a dust storm, which looks a little like the Mars ones. Yes ! This was the first Martian simulation in which I participated. I wanted to do the martian simulation of the Austrian Space Forum since I met it in 2015. I was looking for an association that prepares martian simulations in a professional way, which puts the participants in realistic situations. This makes it possible to test the motivation of the participants so as they could feel fully involved in the next steps. So there is not really any selection, it’s about motivation and availability for the program. The selection is natural. Then there are 3 training sessions “dress rehearsal” of several days with your team. I realized that it took about two weeks to be confortable, to be fully operational, to create a sort of day-to-day management routine, and to be effective when working with colleagues in the field. Four weeks is almost too short, I think we could easily have done six weeks of simulation, but it is limited by the participants avaibility. This experience gave me a realistic and credible view of what a mission on Mars could be, both technically and psychologically. It has really strengthened my attraction for this type of mission. So I would be very happy to sign for a real mission ! We did not grow potatoes because the Italian space agency asked us to test a hydroponic crop, seeds that grow without soil, with sediment. We ate them at the end, but it was primarily to test this type of culture. We also ate potatoes, but we did not grow them ! The meals were the most similar to a “normal” life because we were in simulation all day. Once all around the table, we told about our day as we do in everyday life, as if it was normal, as if it was a routine, while we were in a tent lost in the middle of the Oman desert. I imagine that the astronauts who will actually go to Mars will have the same type of conversations ! Each participant had multiple roles in the field, and was the person responsible for a specific subject. I was responsible for the resources management, especially water. We lived independently, we had calculated before the mission how much water would be needed. Rules had been defined, such as limiting the duration of a shower to 2 or 3 minutes, much like in the army. One day, we had an unexpected water leak (it was not a breakdown scenario planned before the mission). Water consumption was higher than expected. First of all, we investigated whether a participant had used more water than expected, for example to do the dishes or take a shower. But after 24 hours, we realized that the problem persisted, that the water losses were significant and that we could not achieve the mission if it continued. So I gathered several people to control all the areas that could have water on the Martian base. We discovered a small water leak in a lavatory located in one of the areas used by journalists and scientists during the first 3 days of the mission. We cut the water in this area and thus isolate the water leak. Extensive tests were done for 48 hours. We were reassured to see that water consumption was returned to normal and that we had not to ask for extra water. The problem was solved ! I think that these are interesting projects provided they use resources available on site to build external housing bases or use sheltered areas, such as lava tubes on the Moon. I think that such projects will materialize in the medium term. I think if we want to explore Mars, we have to go to Mars, in the same way that man discovered new lands by crossing the seas. Nevertheless, establishing a lunar base would be a first step towards Mars provided that this lunar base allows to prepare the experiments that would take place on Mars. We would then take advantage of the proximity of the Moon, which is an asset for the transportation of materials and machines that would allow experiments. 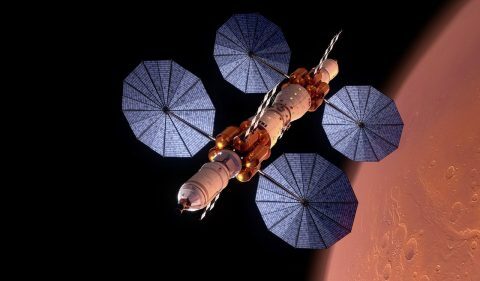 The first missions will be used to provide the minimum that is need to live on Mars : hydrogen, a nuclear reactor for energy generation (a few hundred kilowatts), a pump system to extract CO2 of the martian atmosphere. With this, by chemical reaction can be obtained water, oxygen and methane. These are the first missions that should bring these essential elements to Mars. We could go to Mars in a spaceship that would also be an habitat, so we could stay in it. This spacecraft could be built with a 12 centimeter thick water shield to protect against solar flares. With that, we could build the priority structures we need in the short term on Mars. Then, other missions would come to build complementary structures on Mars. The combinations allowing the EVA are true technology jewels. They regulate the pressure, the oxygen, the temperature. We know that the EMU space suits used for the ISS tend to deteriorate over time. Today, we are trying to design space suits with more stable materials. The Z2 space suit being developed by NASA is particularly suitable for planetary exploration. The astronaut puts on the space suit through a hatch at the back of the space suit. It’s much easier for the astronaut to remove it. The asset of this space suit is that it can be hung outside a space habitat. It allows to enter without dust contamination. It is very clever ! The duration and the cost of development are very important, but I think that this kind of “new generation” space suits will be used for martian exploration. 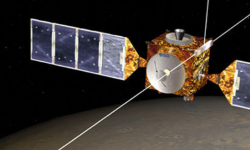 A delay of 10 minutes was set between Earth’s communications to Mars and between Mars to Earth. During simulation, communication is possible via consoles. The console located in the operations center of the martian base sends its data by chat to the Earth, with 10 minutes of latency. This allows the control center on Earth to know how the analog astronauts mission is going, and possibly to adjust some parameters. Indeed, the Earth control center is in constant contact with laboratories and research centers that have ordered experiments on Mars. Thus, if the data collected on Mars does not conform to what the sponsors of the experiment were waiting for, this makes it possible to ask the analog astronaut to adjust or not the parameters of the experiment. If the communication is lost between the analog astronaut who does an experiment outside the martian base and the operations center on the martian base, there is a procedure : the analog astronaut must return to the last point where a communication was possible. For a few minutes, there will be no communication between the analog astronaut and the martian base, but the time that the Earth control center base is informed, the problem has already been solved ! The Earth control center base therefore has a mission support role, not a takeover of events. I do not have a precise duration in mind, I would especially like to spend enough time on Mars to see concretely the results of the actions that I would have realized on the spot, and to be able to see by my eyes if what I imagined is concretized in fine. Before going to Mars, the management of the absence of gravity in space must be further improved because there are real impacts on the human body. When astronauts arrive on the planet Mars, they will have to be in good physical condition because there will be many tasks to do on arrival, mostly very physical. It is therefore necessary to make concrete experiments to artificially create gravity. For example, some people imagine spaceships rotating on themselves to obtain 1-G. The lack of gravity during the travel to Mars is for me a major challenge that we have not yet responded to concretely. If Elon Musk keeps his promises with the SpaceX’s Starship, the first landing of man on Mars could take place during the next decade, which would give an incredible dynamism to the martian exploration. Otherwise, I think it will not be until the 2050s. If I were offered a ticket on a spacecraft to Mars, I will go even if the conditions on Mars are difficult because crisis management procedures will have been thought out, implemented and repeated before the mission to face these difficult conditions.